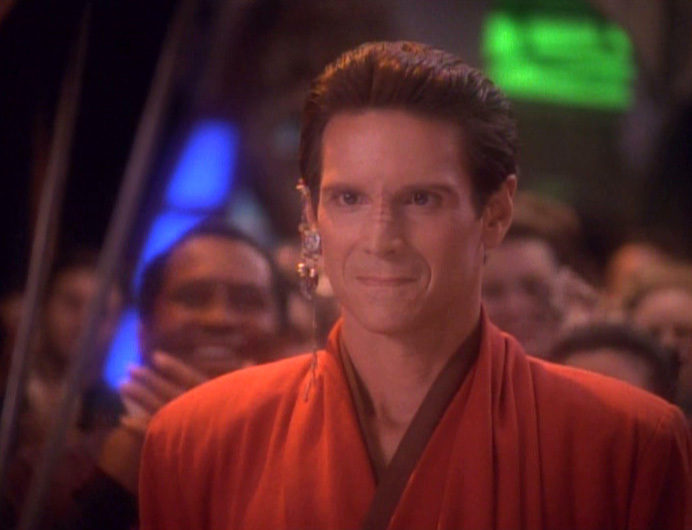 As you doubtlessly know from listening to the show it's no great secret that we have a soft spot for tragically short-lived Bajoran spiritual leader, Vedek Bareil Antos. Ever since first popping up in conversation way back during our third episode, he's become a go-to running joke and - some would say - beloved podcast mascot. Well, in honor of the close of our first full year of podcasting we have decided to gift unto all of you a secret project that has been long under construction. The way we figure it, all great heroes deserve an anthem. And now, thanks to Subspace Transmissions, Vedek Bareil has his! Step up on the Springball court/ Guess what? You'll be smartin'! Do I trust Sisko? I dunno/ But cray-cray Kai, batty Winn gotta go! Save your positronic implant, me I'm blessed! Spinning records till dawn like a dabo wheel! Sorry. No one would call him a beloved podcast mascot. With a little luck, this is the last time we hear about him for a while!